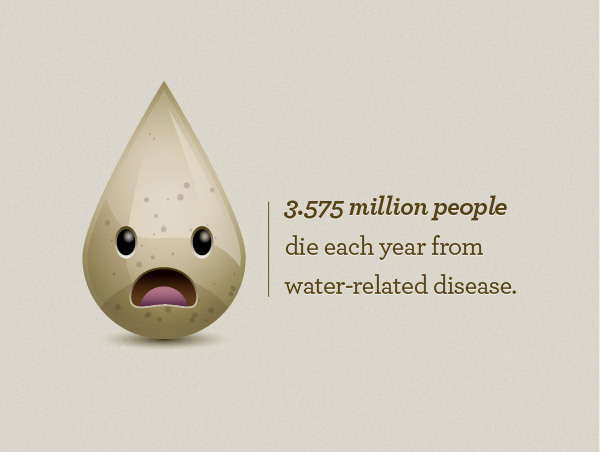 Did you know that 3.575 million people die each year from water-related disease? Moreover, 884 million people lack access to safe water supplies; approximately one in eight people. That’s pretty crazy! To spread the awareness about The Water Crisis, you can create the following Illustrator tutorial and learn more about the crisis at Change.org. Blog Action Day is an annual event that unites the world’s bloggers in posting about the same issue on the same day. Their aim is to raise awareness and trigger a global discussion around an important issue that impacts us all. Clean water is essential for our survival, but dangerously scarce. Nearly one billion people in the world today don’t have access to clean water and 42,000 people die each week from water-borne diseases. And the issue doesn’t stop there – water availability impacts a wide variety of issues from the environment to women’s rights and from technology to fashion. Below is the final character we will be working towards. Create a new document and create an ellipse with the Ellipse tool (L). With the Direct Selection tool (A), select the top anchor in the ellipse and drag it up almost doubling its original size. With the anchor point still selected, the Control panel defaults to Anchor Point tools. Press the Convert Selected Anchor Points to Corner button. Take off any stroke applied to the ellipse and fill it with a Radial Gradient. For this gradient we are going to add one more color stop creating a total of three color stops. To add a color stop to the gradient, click right below the Gradient Slider in the Gradient Panel. Change the first color stop’s color to a light tan color, the second to a slightly darker tan color, and the third to a darker tan color. Select the middle color stop and change the location to 32. Select the middlepoint between the second and third color stop and change the Location to 60. Create another ellipse and cover the lower fourth of the main drop shape. Select the the drop shape, Copy (Command + C), and Paste in Front (Command + F). Select the copy and the new ellipse and press the Intersect button from the Pathfinder panel. Fill the new shape with your tan color, change the Blending Mode the Multiply, and set the Opacity to 40 from the Transparency panel. Select the main drop shape and go Object > Path > Offset Path and in the Offset dialog change the Offset to -5 px (this value might be different depending on the dimensions of your original drop shape). Create a path with the Pen Tool (P) and where it overlaps the body of the drop, create a wave shape the starts about half way up the body and ends close to a fourth the way down the body. Select your pen shape, the offset copy, and press the Intersect button from the Pathfinder panel. Change the fill of the new shape to a linear gradient with both color stops white. Change the opacity of the first color stop to 32 and the opacity of the second color stop to 14. Change the Angle of the gradient to 90 and the middlepoint Location to 30. Select the main drop shape and go Object > Path > Offset Path and in the Offset dialog change the Offset to -5 px (this value might be different depending on the dimensions of your original drop shape). Hold the Alt / Option key and use the Selection tool (V) to drag out a copy of the offset. Rotate the offset slightly to the left and place over the original offset so the top points line up. Select the offset and its copy and press the Minus Front button from the Pathfinder panel. Fill the new shape with a three color stop linear gradient. Change the first color stop to white, the second to a light tan, and the third to white. Change the location of the second swatch to 60, the middlepoint Location between the first and second to 80, and the Angle to -90. Next, change the Blending Mode to Multiply. 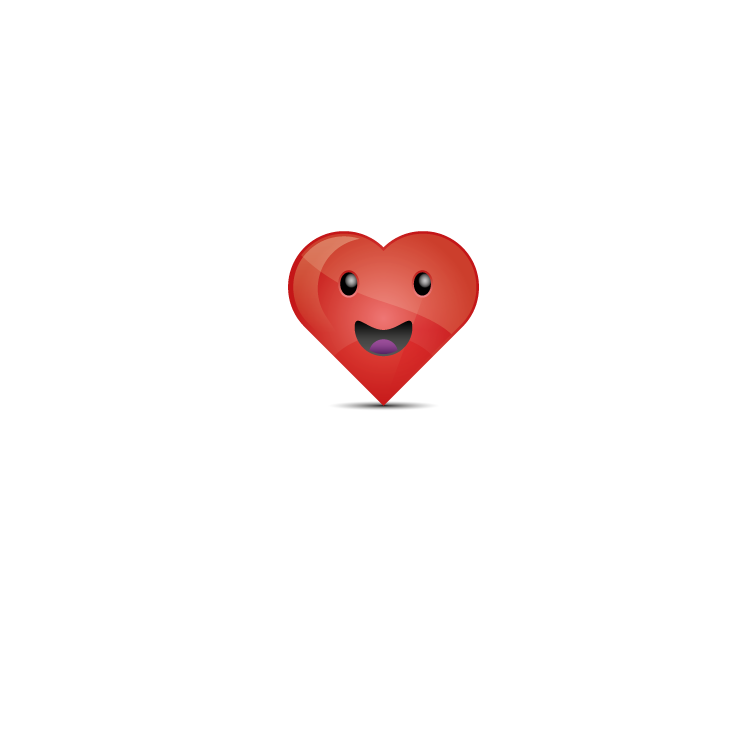 Select the main drop shape and offset it by 10 px. Drag out a copy of the offset and rotate like in the previous step except rotate it to the right. Select both shapes and press the Minus Front button from the Pathfinder panel. Draw a rectangle with the Rectangle Tool (M) about half way down the main drop shape covering the bottom of the offset shape. Select the offset shape and the rectangle and press the Minus Front button. Change the fill of the new shape to a linear gradient with the both colors stop white. Change the opacity of the first color stop to 30, the second one to 0, set the middlepoint Location to 60, and change the Angle to -90. Create an ellipse and fill it with a gray and white color stop radial gradient. Make the ellipse about as wide as the water drop shape. 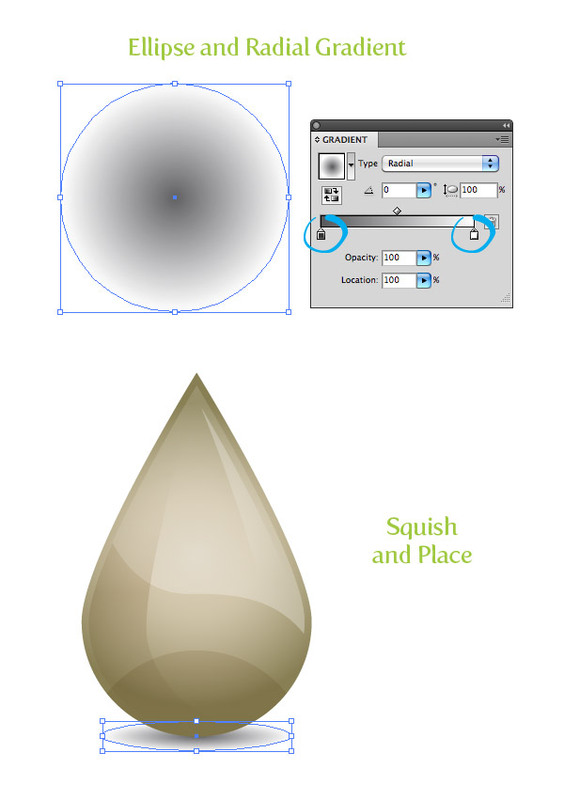 Squish the ellipse with the Selection tool (V) and place it below and behind all the drop shapes. Create a super tiny ellipse (mine is only a couple of pixels wide) and fill it with a dark brown color. Drag the ellipse into the Brushes panel and when the New Brush dialog opens, choose Scatter Brush. The follow Scatter Brush setting are what I am using. Your settings might be different depending on the dimensions of your artwork. Change the Size to Random from the Size pop-up menu, change the first percentage to 44, and the second to 155. Change the Spacing to Random from the Size pop-up menu, change the first percentage to 802, and the second to 67. Change the Scatter to Random from the Size pop-up menu, change the first percentage to 1000, and the second to 333. Select your new brush in the Brushes panel, select your Paintbrush tool (B) and create a couple of paths over your drop. Vary some of the opacity levels of the different paths to add some depth. The dirty water drop is looking pretty good! Now we can add a little more character to it with some eyes and a mouth. First, create an oblong ellipse over the left middle part of the drop shapes and fill it with a radial gradient. Change the first color stop to a light gray and the second to black. Use the Gradient Tool (G) to adjust the gradient so it sits in the top right corner of the eye shape. Offset the eye by 2 px, change the fill of the offset to a linear gradient with the first color stop white, the second a brown color, and change the Angle to 90. Now we have one eye done, select the eye shapes and drag out a copy to the right of the drop shape. Draw an ellipse towards the bottom of center of the main drop shape. With the Direct Selection tool (A), select the bottom anchor point and drag it up about half way up the height of the ellipse. Fill the ellipse with a linear gradient, change the first color stop to brown, the second to black, and change the Angle to 90. Next, offset the mouth shape by 2 px and fill with the same linear gradient as the eyes offset. The last step is the tongue. Create an ellipse and place it half way down the mouth. Select the main mouth shape, Copy (Command+C), and Paste in Front (Command+V). Select the tongue and mouth copy and Intersect them. Change the fill of the new tongue shape to a linear gradient, change the first color swatch to a pink color, the second color a darker pink color, and the Angle to -90. That’s it! Now you can place your dirty little drop in ads, posters, or whatever. Check out Water.org or CharityWater.org for some great facts the compliment you dirty drop. Here it is again. That wasn’t too hard, right? On step 6, you have you offset to -10 px then copy and paste in front. Take Copy of offset and the drop shape then minus front. That was way confusing, yet inspiring. Loved it! I need a little help here. I’m at step 4 where I supposed to select my pen shape and the offset copy, but as the newbie I am, I don’t know how to do it. I’ve drawn the curve in the drop after learning how to do it. Hope a kind soul or two can help me with this. I wanted to learn illustrator with this tutorial, but I can’t get through step 2 where you talk about pathfinder. Very nice tutorial, thanks and particulary because it whas my third illustrator tutorial, and i understand everything the first time. This tutorial looks amazing!…I was so eager to learn this nice tut today but I got stuck and can’t figure it out. Don’t know what the problem is. I work with Pc and adobe Illustrator CS4. Could that be the reason ? The problem : The Step 3 and 4…Actually since I am having problem with Step 3, Normally couldn’t get to Step 4. except if I cheated which didn’t work til the end anyway…lol. Well, After creating the second ellipse, we must copy the drop and past front, right? Well, I’ve done the same thing but unfortunately whenever I wanted to select the copied drop and the second ellipse to use intersect option, the both drops got vanished! 🙂 great tutorial, I’m just starting with vectors, and I was really enjoying this well prepared tutorial. I am a little late to the party, but here is my stab at the tutorial. HEY MAN, NICE TUT, WAS FUN TO DO…. Great tutorial, easy to follow and well illustrated… thanks! wow! easy tutorial but effect is awsome! This was a lot of fun to do! Thank you very much!! I’ve learnt a lot from this. Really appreciated the social message!! !Thank you, GBU. Great tut. Simple way but the outcome is amazing. Para que todos pensemos en lo importante que es cuidar el agua. love the color been use in this little character. Great tutorial, nice and simple, with a beautiful outcome. And we should all contribute to the cause!